Identify measuring tools from the ESY Toolbox. Demonstrate precise measurement when following a recipe. Discuss the traditional view of death in Día de los Muertos and articulate the role of food in honoring loved ones in the holiday. Select the correct measuring tool for each ingredient in the Pan de los Muertos recipe. Practice precise measurement to follow the Pan de los Muertos recipe to completion. Shape a piece of bread dough into a shape that honors someone in their life who has passed and write a remembrance to place on the Día de los Muertos altar that celebrates that person’s or creature's life. Copy the Pan de los Muertos recipe to hand out. Cut up construction paper for the remembrances and place on the altar with colored pencils for writing. Welcome students back to the kitchen and introduce the lesson for the day. Today we are going to celebrate Día de los Muertos by making Pan de los Muertos. Who knows the name for this holiday in English? Day of the Dead. Can anyone tell us a little bit about this holiday? What does it celebrate? How do people celebrate it? Day of the Dead is a holiday that remembers and honors the lives of loved ones who have died. The modern holiday combines 3000-year old Aztec traditions of honoring the “Lady of the Dead” with a full month of festivities and the Catholic observance of All Saints Day and All Souls Day. It takes place on November 1 and 2 and is celebrated throughout Latin America and places around the world with a Latino population. There are many ways to participate in the Day of the Dead. In Mexico and other parts of Latin America, families visit the graves of their loved ones. They clean and decorate the graves, tell endearing and humorous stories, share memories, and prepare and eat their loved one’s favorite foods. It is not considered a sad day, but a day to awaken the dead from their eternal sleep and honor their memories. Families will often create altars or ofrendas where they place food, flowers, candles, photos, and mementos. A traditional offering for the altar is Pan de los Muertos, or Bread of the Dead. That is what we're making today. Can anyone think of another holiday that falls around that time of year, maybe near the end of October, that deals with the theme of death? Halloween. Halloween and Día de los Muertos share the theme of death but actually have completely different origins. Halloween originated with Celtic pagan rituals in Northern Europe. There are holidays all around the world that happen at this time of year that deal with the theme of death. Why do you think these two holidays might happen around this time of year? They mark the turning of the season—the transition from the fall harvest to the colder, darker winter months. They both began as ways for human societies to honor death as a part of the human experience. In the cultural tradition of Mexico, and much of Latin America, Day of the Dead celebrates death as a part of the human experience, not a time of grieving and sadness. In fact, tradition holds that to be sad would offend the dead, so Day of the Dead festivities honor them with laughter and joy. Today we will be celebrating Day of the Dead by making Bread of the Dead. You will be making the dough and then dividing it among your table-mates. Each of us will make a piece of bread to honor someone who has died. Once you decide who you would like to remember and honor, you will form your dough into a shape that represents them in some way. Maybe your Grandma loved to fish and you make your bread into a fish shape; maybe you had a beloved hamster who slept in a sock and you shape your bread into a sock to represent them. You may choose to honor someone you knew personally or someone from history whom you admire but never met. What is important about this lesson is that you choose someone who means something to you. Traditionally Bread of the Dead is baked and placed on the altar. Today we will be eating the bread we make and placing a written remembrance on our altar. You may choose to share your remembrance or keep it private. In this lesson, we’ll be engaging with food as something that nourishes not just our physical health but our emotional and spiritual health as well. The ritual of making food offerings to the spirits of those who have passed for Day of the Dead recognizes that food is deeply emotional, and can strengthen our connections to people who have passed, as well as the communities we surround ourselves with. Today as we bake, reflect on a food that nourishes more than just your body. 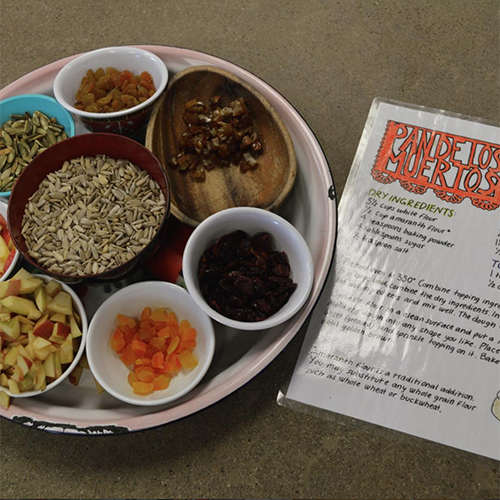 Students prepare Pan de los Muertos and remember loved ones. Small-group check-in: What is your favorite baked good? Meet with the table groups to review the recipe, check in, and assign jobs. Review measuring tools (measuring beaker, measuring cups, and measuring spoons) and the different measuring increments (e.g. 1 tablespoon, 1 teaspoon, ½ teaspoon). Explain how to measure precisely. While the bread is baking, invite students to write a remembrance and place it on the altar. Eat. While the students are eating, invite them to share whom they made the bread for, what shape they chose, and why. Students reflect on the recipe and their experience in the kitchen. Ask students to rate the food on a scale of 1 to 5. Ask students to rate the experience on a scale of 1 to 5. Allergies: We double-checked before every class that we knew of all the students with allergies or eating restrictions that would prevent them from enjoying the recipe as written. We created alternate recipes for those students to cook and eat. For vegan bread, we substituted 2 tablespoons applesauce for 2 eggs and an equal amount non-dairy milk for dairy milk. For gluten-free bread we substituted 1:1 gluten-free flour mix for wheat flour (amaranth flour is gluten-free). Creating space for grief: Some of our students came into this lesson in various stages of grief, and every student had different norms, levels of comfort, and strategies for engaging with the theme of death. We communicate with teachers and counseling staff before each lesson to be aware of students who might need extra support. We never force a student to share more than they want to (we are explicit with the "opt-out" option during all group discussions) and hold ourselves and our students to rigorous standards of respect (sometimes using the language of "risk and respect" to honor that sharing something important or intimate can feel like a risk and should be met with equivalent respect). We recognize that even with our best intentions, this lesson still was not altogether enjoyable or easy for some of our students freshly dealing with grief. This remains an area of growth for us. Planning for success: We asked students to start thinking about who they were going to shape their bread for as they were washing their hands. If students had a specific idea about who they were shaping their bread for, we found the activity was far more successful, focused, and meaningful. Personal anecdotes: At the small group, either before dividing into jobs or just before handing out the dough, teachers shared a personal anecdote about who we were making our bread for. We didn't necessarily go into the details of how the person died but focused instead on remembering and honoring the person's life and our memories of them. We found that these stories were helpful to students to hear, in choosing who they would make their bread for, how they would shape it, and also for setting the tone for them to engage thoughtfully with the lesson. Often these stories prompted very thoughtful discussion around death, grief, and mourning, and sometimes were met with reciprocal shares from students who felt safe to be more vulnerable after the teacher created space for that. Toppings and mix-ins: We found that the toppings and mix-ins were crucial for the students to have enough work. Class runs much more smoothly when students are occupied with enough cooking jobs. We also found that having a variety of toppings inspires artistry and care with the activity. Mixing the nuts and fruit into the dough while shaping can be fun and make bread more delicious. Kneading: We found that class ran the most smoothly when the teacher partially or fully kneaded the dough. Especially at the beginning, the dough will be sticky, so having a teacher knead was necessary for time’s sake. This was a good time to explain how kneading builds structure in the dough by organizing the gluten to yield bread with a springier texture. Students often noticed how much smoother it became. Cleaning with flour: Clean the dough out of the bowl and off hands with flour. This saves dough and saves the drain from getting clogged. Cinnamon sugar: We found that having the teacher sprinkle cinnamon sugar on the bread right before baking helped to avoid a sugar-frenzy. Measuring games: Anticipating some downtime while the students were waiting for the bread to bake, we developed a few measuring games for students to practice precise measurement. At one station we put a quart-size yogurt container filled with water, a measuring beaker, and some measuring spoons in a bus tub. On a note card, we asked them to figure out how many cups were in a quart, and how many tablespoons were in a quart. At a second station, we put a bowl of flour, a cup measure, and a baking scale in a bus tub. On a note card, we asked students to see what the heaviest cup of flour they could make was, and what the lightest cup of flour they could make was. At a third station, we put a bowl of salt, an empty bowl, some measuring spoons, and a ¼-cup measure in a bus tub. On a note card, we asked how many teaspoons were in a tablespoon, how many tablespoons were in a ¼ cup, and how many teaspoons were in a ¼ cup. At a final station, we filled a large clear container with dried rice and asked students to estimate how many cups were in the container, promising a prize at the end of the lesson rotation to the student with the closest estimate. Use basic techniques as instructed, and refer to them by name in conversation.